PAX East began with our jaws on the bus’ floor. I will attempt to explain what we saw with a modicum of justice… and fail miserably to convey the experience. The Boston Convention and Exhibition Center (sized at roughly six city blocks long by four wide) was located at the heart of the city, surrounded on three sides by channels. One could see the flashing demos of various games across a huge screen from the outside, and hordes of colorfully dressed fans lined up, waiting to get in. Between the center and the hotel, several sports cars rested inside the parking circle; Twin Lamborghini of an orange-turned-yellow color, two pink three-wheeled Polaris models and a few massive trucks. All of these wore markings of Blizzard’s Overwatch. After perhaps 30 minutes of checking in, the skywalk between the hotel and convention center was traversed. I was permitted inside before the opening time thanks to a special Exhibitor’s badge furbished by Versus Evil, and was eager to check in with the booth. But once inside, the scale of the convention made navigation challenging. The upper two floors consisted of a handful of large theaters for hosting the panels, easy enough to understand. The ground level was something else entirely. This photo captures perhaps 20% tops of the sheer size of the show floor. The aisles were packed to the gills with flashing monitors, colorful displays, merchandise and posters, game demos and videos, manikins and hardware. Within not five minutes of the chimes sounding the show’s opening, the alleys and walkways were flooded with thousands upon thousands of fans, cosplayers, exhibitors, media personae and personnel, staff, crews and enforcers. Human traffic clustered and congested everywhere. Even the merchandise stores required fifteen minute lines to get in, although everyone around was excited and in high spirits so the time went fast. The fans were easy enough to talk to. For Friday, the Versus Evil guys cut me loose to play. The first order of business was to hit up the Bethesda Store and score some gifts for friends and family, followed by the demo for Total War: Warhammer. Sega’s vision proved excellent, truly capturing the feel and appropriate scale of the conflict while remaining true to the themes and aesthetic… perhaps better than anyone else who has ever attempted it. The battle was perhaps twenty minutes long and perfectly eluded the sense of desperation and grimdark that is the hallmark of the Games Workshop’s fantasy universe. If the treatment of this game is anything to go by, then Dawn of War III will be faith rewarded for long time fans indeed. To probable delight of these guys. Time was spent trying Zombie Vikings, the game that that Zach Weiner of Saturday Morning Breakfast Cereal helped produce. Guild of Dungeoneering and Let Them Come were also sampled and enjoyed. Still, there was simply too much to see, so the board and card games were briefly toured, the vintage video game vendors browsed and the props and demos admired. Time is the most valuable of currencies and there’s never enough to spend. For Saturday was the big day. Arriving at the panel a tad too late to get a front row seat, the opportunity was not wasted to snap several photos of the Stoic Studio guys on stage. 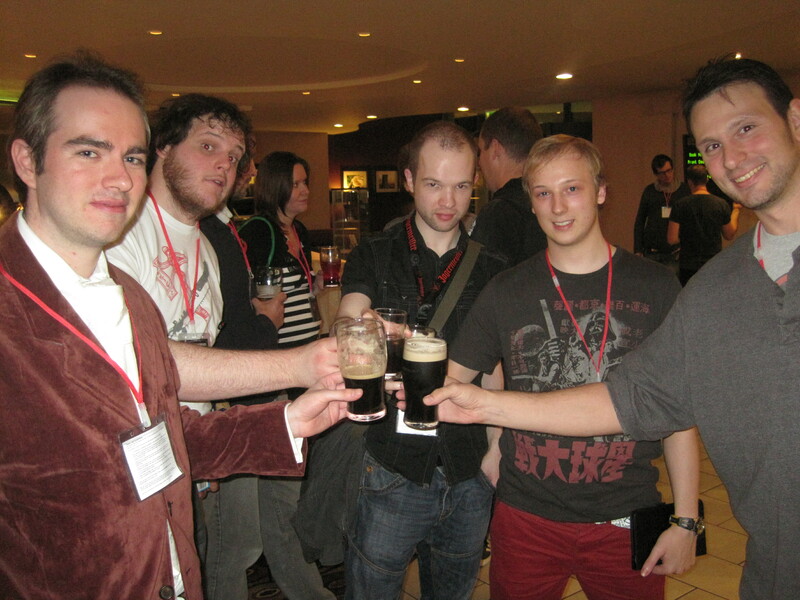 In order from left to right was Technical Director John Watson, Art Director Arnie Jorgensen, Technical Designer Matt Rhoades, Lead Writer Drew McGee and Composer Austin Wintory. After a comical trailer by Kris Straub (contains spoilers), they spoke about the challenges and efforts of their latest title. Their conversations sparked intriguing lessons, particularly how Austin wrote music based on Drew’s story, which in turn prompted changes to Austin’s tunes. Considering this, if two elements of a game are “speaking” to each other, then there was probably reactionary work done on the technical and artistic side as well. This could have meant a four-factor (art, music, story, tech) feedback loop of on-going innovations. Another point of interest was Austin’s discussions regarding the music of series. Not just a composer but a full musical scholar, he explained how there was little historical understanding of exactly what Viking music sounded like exactly. And how this permitted a degree of freedom to craft based around discovered instruments without any clear instructions or reliable knowledge of their application. After fan questions came the cosplay provided by the talented Danica Rockwood, Lady Devaan and especially the Dredge costume of Jackie Craft. 11 am was my time to shine, and I hurried down to the booth for the first novel signing of my career; 200 printed copies to be given out to promote the game. Waiting at the booth for the set up, I thought back about the few other book signings I attended in the past. Which authors made me feel awesome about reading their stuff? Who were the writers whom I remember the most fondly meeting? There was Gav Thorpe, who listened to me explain how much I loved his 13th Legion trilogy enough to carry it over the Atlantic Ocean for his autograph. Clint Lee Werner, who had intriguing discussion points about where he gets his ideas. Chris Wraight, who was the nicest guy I had ever met. And Sarah Cawkwell, who encouraged me to keep writing. 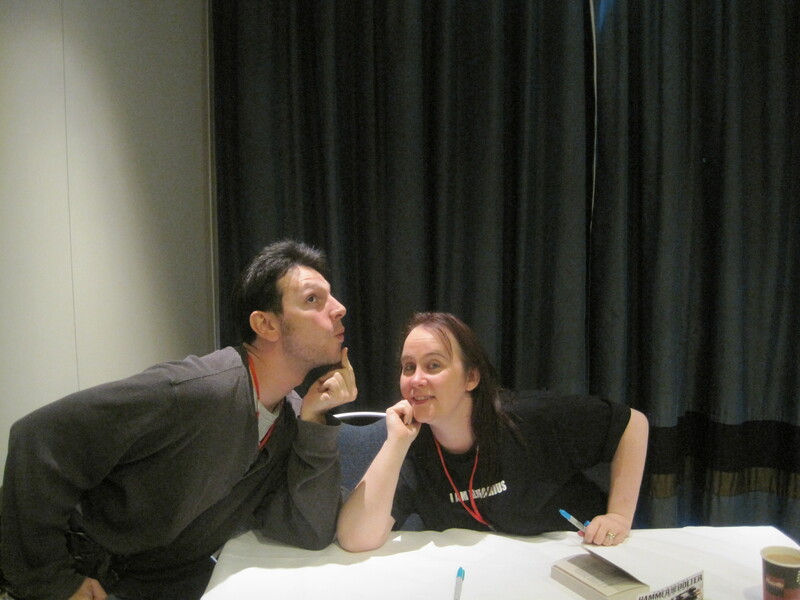 I hadn’t realized it until that moment, but they had taught me how to handle visitors of book signings. I did my absolute best to keep smiling and finding points to engage people, and to always start with asking their names and writing it down in order to remember and use it when parting. This made it easier to remember people, like the friendly PAX Enforcer Malachi who dropped by again on Sunday to shake my hand. Whenever possible, points of shared interest were discovered; the recent season of Daredevil, the games we enjoy, our favorite things about the Banner Saga. I knew there was a line of waiting people, but I also really wanted to try and give anyone kind enough to drop by an experience that would (hopefully) keep them coming back. Whenever there was nothing to go by, discussion arouse regarding the book (“It’s a prequel– No spoilers. You don’t have to have played the first game but I highly recommend you do!”), or encourage them to play the demo (“It’s around the corner, try it! You’ll get a free pin!”) If nothing else, there was PAX East itself and what we hoped to see. Whenever met, encouragement was given to other writers, artists and hoping-to-be game creators to keep at their craft. And keeping tabs on KickStarter video for the Banner Saga: Warbands board game proved wise, as answers were rendered basic questions about it. It helped to be as excited for the game as anyone else who inquired. Although four hours were set aside for the signing, I decided to remain an additional 30 minutes so any last minute folks could have a chance to grab a copy. By the end of Saturday, more than half of the books were gone. Checking back the following morning to see how well we did, there were perhaps 40 or so copies left to hand out before 11 am. In the end, the event was a real taste of what it was to promote and market side of the writing business. The experience was actually fun and something I’d relish doing again someday. Ahh, Merry Christmas everyone. Although I write these words exactly at 12:00 am on December 26th. Well, whatever. So Christmas has come and gone, and the New Year is almost upon us. It’s a good time to talk about the books and games I’m most looking forward to in the coming year. I had just finished Gears of War 3 for the first time tonight. While it was a damn fine ending to the trilogy, and more than satisfactorily completes Marcus Fenix’s story, I found myself missing some elements that were more prevalent in the first two games. More paths you could choose, the campaign could have been a dash longer either through an additional act, or more portions from Baird and Cole’s point of view, like they did in the first act. On that note, I’ll certainly be getting more of Cole and Baird soon. Gears of War: Judgment is on its way. That game will probably be second on my most wanted list. Starcraft II: Heart of the Swarm is yet another one worthy of mention. Unlike most die hard Starcraft lovers, I’m just looking forward to the story and campaign. Multiplayer just isn’t my thing for RTS. Castlevania: Lords of Shadow 2. I’m almost finished playing the first one and I am considering getting the DLC as well. I almost forgot Dead Space 3! Finally, last and probably best of all, Bioshock: Infinite. I think that needs little explanation. But just in case, take a look at the trailer. Now, for books I am choosing both previous and to be released books. But on my ‘most looking forward to reading’ list is All Quiet on the Western Front by Erich Maria Remarque and King Solomon’s Mines by H. Rider Haggard. That latter was recommended by C.L. Werner. Other books of mention include Ravenwing by Gav Thorpe, and Headtaker by David Guymer. Guymer I actually met at the Black Library Weekender. Having published a few short stories, Headtaker will be his first Warhammer novel. Finally, movies. I’m going to be a bit conservative about this, and mention Iron Man 3 and The Great Gatsby. Truth be, there are many good sounding movies, like Oblivion, Thor: The Dark Worlds, Sin City: A Dame to Kill For, Man of Steel, Ender’s Game and Star Trek: Into Darkness. But truth be told, I haven’t seen most of the trailers nor done any research. I’d rather wait until near release to begin looking into them. So that’s all for next year’s excitement. Stay tuned for my new years resolution, which I will immediately fail to keep. The blog is undergoing a slow, steady set of changes that have already begun. I’ve mentioned it before, but little by little, it is evolving. The “Sample Writing” section has become “Professional Works”, which will be growing in the next three weeks. The “Hip Cats” section of the blogs will no longer be listed by screen names but real names. The “Publishers” list is going to get cleaned and a new site or two will be added shortly. The art and Warhammer themes of this blog will remain for the moment, but there will be a gradual phasing away. The random art banner will soon mix different pieces of art into it. The people who have been coming to this site have more interested in general entertainment and writing than Warhammer. And that’s fine. It was not a gigantic attempt, like as a $50 million dollar summer blockbuster. A rumor over at DakkaDakka put the budget for it at around $14 million (£9 million). I gathered that it was not for those uninitiated into the 40k cult. But an idea had been boiling in my head to consider trying my hand at a fan made film someday. 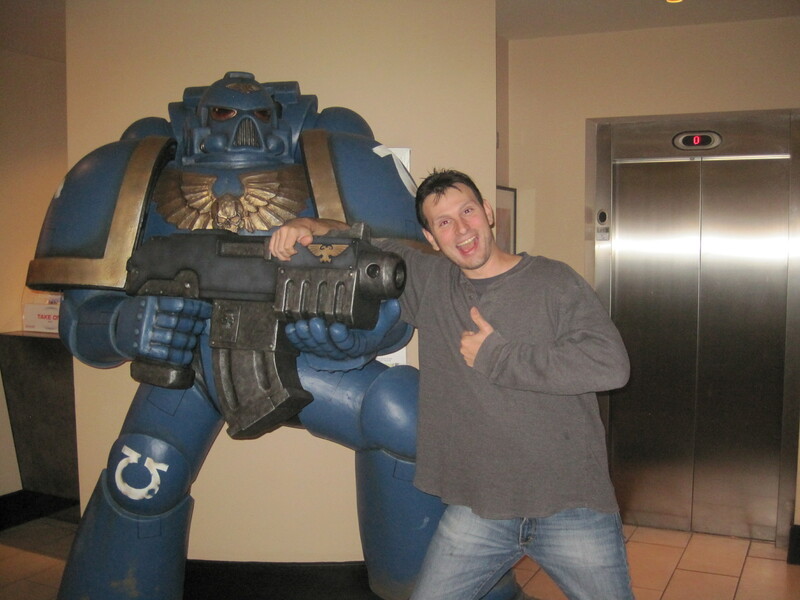 But then I thought about Damnatus, the fan-made unofficial 40k movie that was… “unreleased” a few years back. Story goes that Damnatus was supposed to be a strictly fan made movie with respect to Games Workshop’s IP permissions. The problem came about when it was discovered that German IP laws would require that the movie and its content would belong to the creator of the movie. This loophole was cause enough for Games Workshop to deny permission for its release. The ugly lesson learned is that time would have to be spent reviewing the differences between the IP laws of England and the United States before even attempting. Putting aside the legal groundwork of such an endeavor, I began to think about a lot of the technical details to make a film possible. The first issue was choosing which of the two universes I would prefer, be it Warhammer 40,000 or Warhammer Fantasy. Although there’s more excitement for 40k, I think that Fantasy would be easier to do overall. We can thank Tolkien for giving us a lot of the settings and concepts within WHF, although the Black Library has added its own ugly details, such as the politics and religions, various races both original and not. Still, I believe that the backstory would be easier to settle into over 40k. Another reason for choosing WHF is the physical settings themselves. Both 40k and Fantasy call for urban settings and for backwater locations. Both Altdorf and any hive would be almost too much to reproduce on a limited budget, so an urban location is not preferable. And 40k often has the Imperial stamp over everything. Landing pads, the aquila, all the vehicles… it would be an awful lot to reproduce even if it takes place in a rural area. 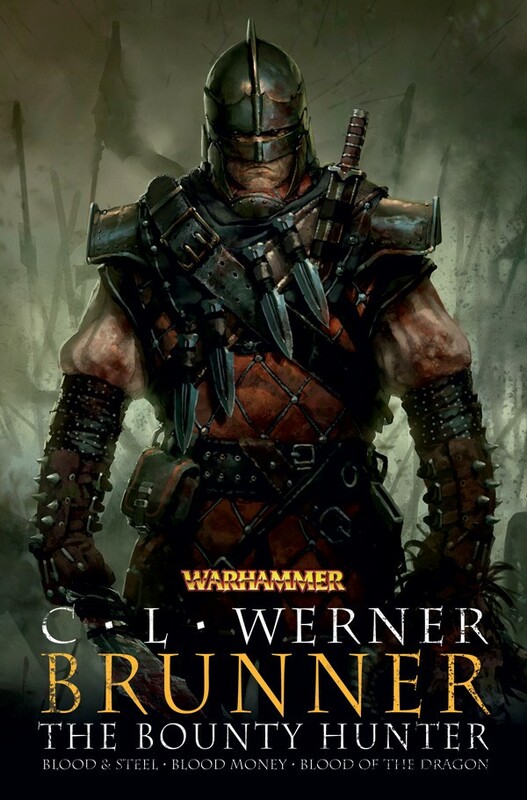 I have recently started reading Brunner the Bounty Hunter, by C.L. Werner. As I ventured through the short stories, it quietly dawned on me that this would be good material to craft a movie from. Not pictured: His marvelous singing voice. First, many of the stories started with some scholarly character who took down Brunner’s tales. This gives the director the option of using a narrator to fill in the details and explain any issues that may not be easily shown on the screen. These stories aren’t overwhelming with the details, and they are both faithful to the source material and easy to spoon feed to the uninitiated. Second, Brunner’s tales thus far (I’m three and a half stories in), have taken place more on along the frontier than anywhere near Altdorf. Finding a place to shoot hills and forests would be much easier than constructing huge keeps and streets, especially on a fan’s budget. Third is the fact that the tales don’t have to be made into a full length movie. The short stories could probably be made into 30 minutes-to-an-hour in length. This reduces the investment of time and money. Rather than banking too much , the success or failure of it can be recognized on a bite-sized piece of film craft. Fourth is the fact that Brunner himself is such a powerful, interesting character. Rather than a tiring origin story or extreme development, Brunner simply is. His motivation is clear. His appeal obvious. That steely action-hero glare just draws you in, regardless of whether you have any idea what Warhammer is. But despite these points, there are hang ups and considerations for a short movie. Of the three stories I’ve finished thus far, two of them involve non-humans. Beastmen and a werewolf. How would I make such monsters on the screen? It’s possible to try CGI if I know the right people, but I’ve never been terrible impressed by that sheen that appears on the surface of digitally made objects. Besides, it would be more interesting to come up with the right costumes and the right camera work to create beastmen. CGI has its place, but I want that place to be as minimal as possible. Although the frontier setting would be much easier to recreate, there are still medieval/colonial settings that would have to be made. This is where being an American on the east coast pays off, as there are many historic locations that might work for this effort. Indeed, I feel the setting is more a matter of research and creativity than stage construction. Another concern is the sheer number of props. Some of it can be alleviated by contacting a group of local LARPers (Live Action Role Players). These guys buy and craft weapons and armor for their sessions, sometimes looking quite authentic and dirty. I’m sure they’d jump at the chance to put together a movie. That would solve many of the problems, but not all. Brunner, for example, would need a well made costume. His sallet and armor would have to be carefully made. He’s also a walking arsenal, frequently described as having multiple throwing knives, a falchion, crossbows, a knife for combat and beheading and black powder pistols. Rather than a single special or weapon, Brunner comes equipped for almost any situation. Another concern are horses. While a horse farm would be willing to provide horses for a price, many scenes involve horses being spooker or involved in combat. And there is absolutely no way I’m going to risk the safety of amateur actors around a large, scared animal. Which brings me to my final concern for the moment. Finding good actors. Brunner has an advantage in that his face is frequently hidden by his helmet. All I’d need is someone capable of portraying a general badass for a few hours, no heavy emotional scenes or points of incredible drama. I think there’s a part of me that would want to try it myself, but being a main actor/director has always struck me as a somewhat vain pursuit. And besides, for a first effort I think it would be best to try just the directing. And everyone else? Well, it depends on the role and whether or not I can find people skilled enough to fill it. I think this Halloween, I’ll keep my eye out for particularly talented costume makers. Who knows? It may solve at least one of these issues. What he did to your chimney is the least of your concerns, because I don't think he's bringing you coal. Anyway, click for more. So the reviews and scores are in. Congratulations to first place winner, MalkyDel! Second place goes to Raziel4707. You can read the holiday stories, but here are the reviews. He got caught up painting pictures. These scenes of description were both beautiful yet run-on. Chunky paragraphs were made from one sentence and a lot of commas. There’s no shame in breaking up sentences and descriptions a bit and pacing them out. Despite their length, I loved the descriptions at the beginning. The festiveness and celebratory nature of the holiday was some of what I was looking for. But towards the middle, it began to become a touch tedious. Drinking, eating, debauchery, we’ve already covered that. Part of me was looking for some kind of holiday tradition outside the norm, like gift giving, or beating a goblin-shaped pinata or just some event that set it aside as a holiday. We dress in costumes and give candy on Halloween. On Easter, we scavenge for hidden eggs. Christmas and birthdays get gifts. You get the idea. The story eventually provides what is effectively two holidays. That celebrated by the dwarves and humans, and that by the lizard men. The story rounds off in a hunt hosted by the lizard men, which clarifies the seemingly unrelated chase scene. I think there was a good idea here that wasn’t executed well, and if I were to redo it, I would have written the tale from the point of view of the lizard men and cover the ritualism and traditions of the Winter Solstice Human Hunt. Otherwise, except for the whooping at the end, why is this any different than what the lizard men do the rest of the year? The thing I love about this story is that it reminds us that there is a legitimate history to holidays. We are so quick to dismiss many holidays as “inventions of consumerism” and never acknowledging that there is a legitimate, historical reason that day is observed. We frequently honor these traditions without ever knowing why! Raziel also got points for inventiveness and not forgetting holiday traditions as the gift giving and other activities. I must admire Raziel’s clever use of the historical retelling as a means to keep the story within a Warhammer 40k context: War. It’s a shame that the story was told like a Wikipedia article instead of a tale through the vox of Rasmusson like many of J.R.R. Tolkien’s Lord of the Rings (although a story told entirely in Dreadnaught-speech caps would… annoy, to say the least). But the tale is generally solid if Wikipedia-ish, making it a touch dry. I think this is our winner. A cool idea, a well told story. A sense of tradition, a touch of history and reasoning. Above all, I like that it takes place from a completely different, weird point of view. The most interesting comments about this piece didn’t come from me, but from our mystery judge, a non-Boltholer named Jacob, who enjoys fantasy and frequently DMs his own gaming sessions. Jacob mentioned that he hates horror, but was pretty fascinated by the bizarre nature of the tale. He was very taken in with it. So well done, MalkyDel. You may have won over a horror hater. Congratulations folks! Look forward to the next competition after the Black Library submission window! Just because I wasn’t updating doesn’t mean I wasn’t writing. There’s no such thing as a holiday when innovation and inspiration alike strike. So I’ve been stockpiling a few reviews for this week, and putting aside a few thoughts to develop into story stoking theories. But first, a little news. So last month, I put down the starting ideas for a new novel for the Black Library submission window that opens in the coming year. We have approximately five months before it opens and eight before it closes. That seems like a lot of time, but the best proof readers don’t normally read up about the Imperium. So we’re stuck with the tricky task of ensuring our writing fits the canon and background as well as proofing and editing, often by ourselves. Laying the foundation for a novel is no easy task. We need a well thought out chapter outline no more than six pages, and three superbly written starting chapters of at least 10,000 words. That could easily run a tab of around 20,000 words, about the length of four to six short stories (or more if flash fiction). That is a tremendous exertion of writing effort. Not only because of the sheer quantity of words, but also because the stories are not reusable. The setting of the Imperium cannot be taken to another publisher. So we boltholers are better off developing one hell of a great story, instead of stringing together dozens of piddly ones that end up rejected anyway. That’s why many of us crazy folks have been working on the next submission window since the last one ended. Although I have the makings of a Warhammer 40,000 short story and novel set aside, I’d like to contribute at least one Warhammer fantasy short story. Which brings us to subject two. I had taken to writing my own original work to try and craft an ebook anthology of three sword and sorcery pieces. I’ve looked up two editors I can trust and am looking for a cover artist. But this is moot if I don’t finish the tales in time. As excited as I am for the Black Library window, this takes priority. One of the three stories is nearly finished. I have some other pieces I am considering for the second slot. But I’ll likely create two new stories to fill this anthology. Next bit. Thanks to Lord Lucan, I got suckered into writing for a horror/western anthology for the Naked Snake Press, delaying me even further. Thankfully though, I’ve already finished and proofed the story. I’m having a few more eyes glance over it before I submit it. Finally, as my last story for Every Day Fiction was rejected, I’ve started and finished a new one. I’m going to update my publishers lists with a few new links now.